Vegetarians and vegans beware! If you’re a herbivore, you might want to shy away from this post 😛 but seriously though. Cockscomb, located in the SoMa District in San Francisco, brings “man food” to a whole other level. Chef Chris Cosentino, winner of Top Chef Masters season 4, closed his Italian style restaurant Incanto last year to open up a new more casual restaurant but still focusing on his speciality: meat and offal cookery. At Cockscomb, his menu is very meat driven and incorporates numerous offal ingredients such as bone marrow, beef heart, pig ears, pigs head, tripe (cow’s stomach lining), and liver. The restaurant itself has a cool hip vibe with an open kitchen and an upstairs bar and lounge area. Main Dining Room and Kitchen. We sat at the chef’s counter which was exciting to watch the cooks in action especially since it was a very busy night. 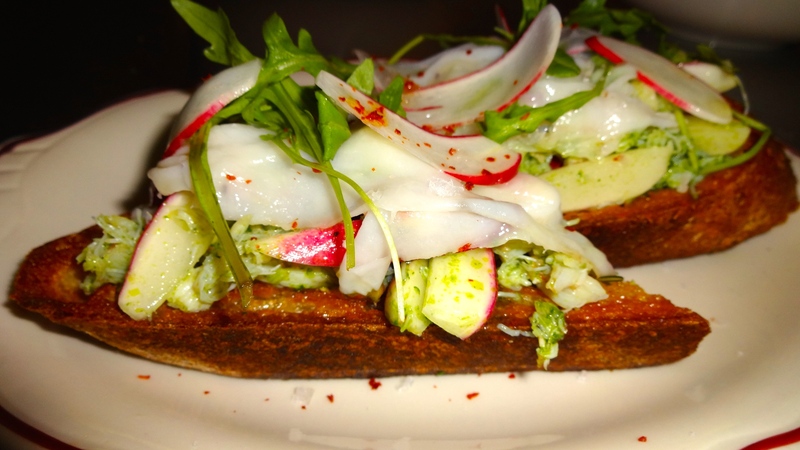 Dungeness Crab, Uni Spread, and Radish Bruschetta (5.5/10). The Dungeness crab bruschetta sounded so delicious but the flavors just didn’t come together; the crab itself was tender and sweet but there was absolutely no flavor of the uni spread and overall the dish severely lacked seasoning. Country Pâté with Pistachios with Cornichons, Butter, Whole Grain Mustard, and Grilled Bread (8/10). 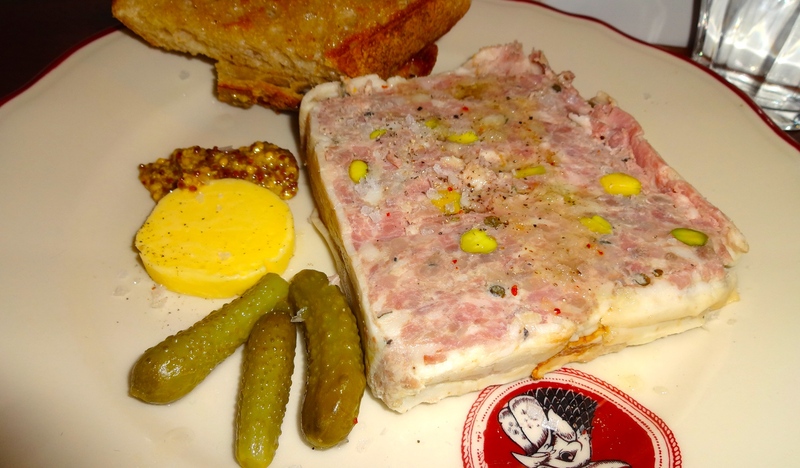 The country pâté was scrumptious with porky goodness and pistachios served with sweet cornichons, salted butter, whole grain Dijon mustard, and grilled bread. Delicious! 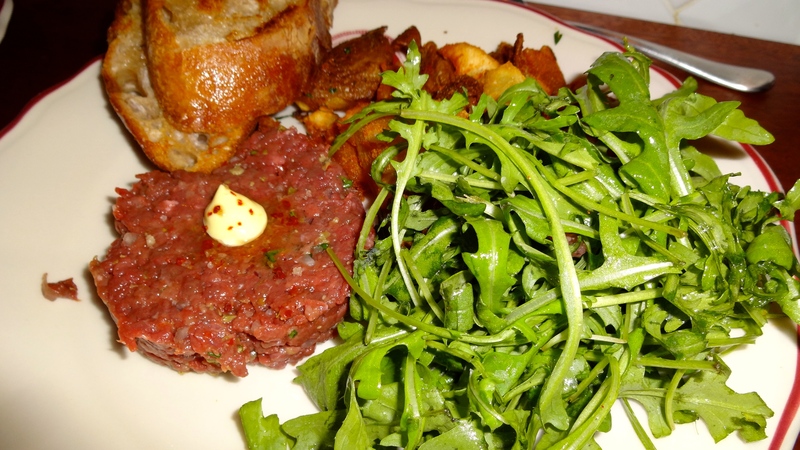 Beef Heart Tartare with Arugula, Fried Potatoes, and Grilled Bread (8.5/10). When I looked at the menu, I saw beef heart tartare which sounded slightly terrifying but also intriguing. The heart tartare was tender beyond belief and paired perfectly with the peppery arugula. 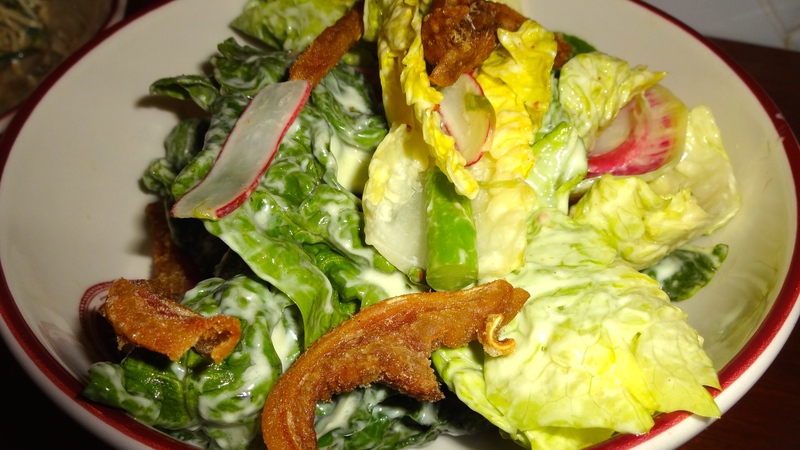 Little Gem Salad with Fried Pig Ears and Green Goddess Dressing (3/10). The little gem salad with green goddess dressing and fried pig ears was another disappointment. Green goddess dressing is supposed to be a flavorful pungent sauce made from mayonnaise, sour cream, chervil, chives, anchovy, tarragon, and lemon juice but their version was extremely bland and also lacked seasoning. The pig ears were fried to death making them inedible because they were too hard. Normally, fried pig ears are crunchy and crisp on the outside but still slightly tender and moist in the inside. 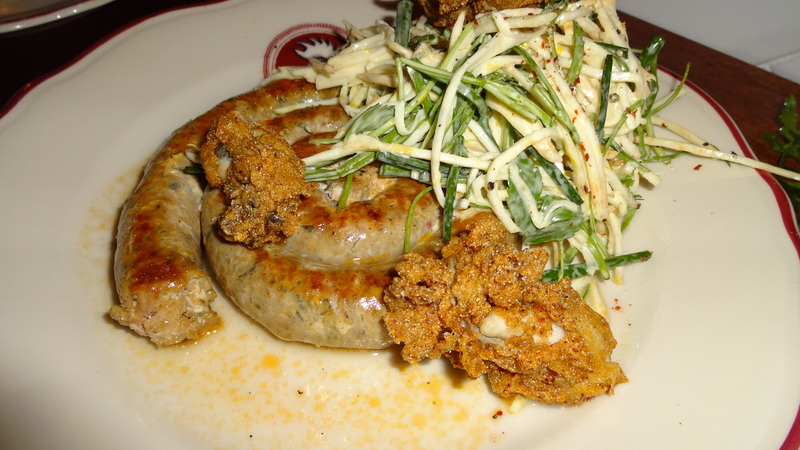 Pork Sausage with Celery Root Slaw and Smoked Oysters (4/10). The pork sausage had no snap to it with a strange mealy texture and an overpowering taste of spices. However, the accompaniments such as the celery root slaw and smoked fried oysters were outstanding. Since we didn’t enjoy the main component of the dish, our server kindly offered to replace it with another dish such as the “ham”burger. 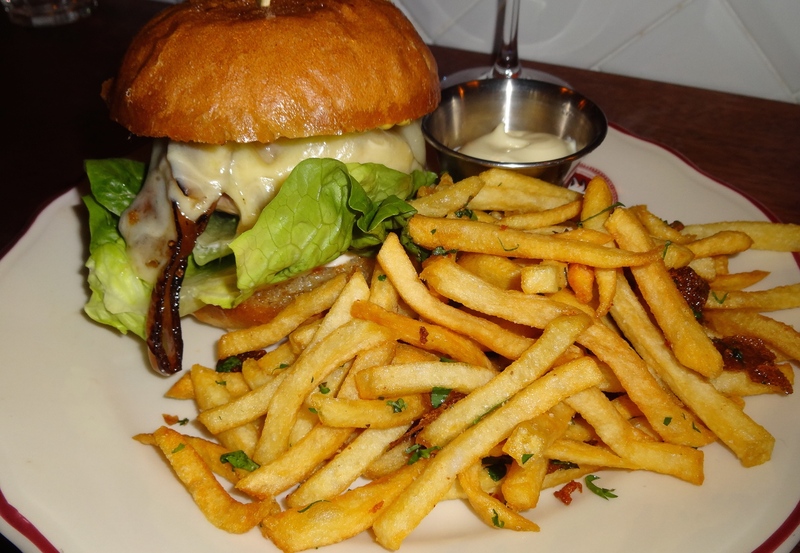 “Ham”Burger with Grilled Onions and Gruyère Cheese served with Fries (8.5-9/10). Now onto the “ham”burger that salvaged the pork sausage incident. First of all, the burger wasn’t even a typical beef burger at all but a patty made from ham. The patty itself was juicy and moist served with delicious sweet grilled onions and funky nutty melted Gruyère cheese. Greasy goodness. 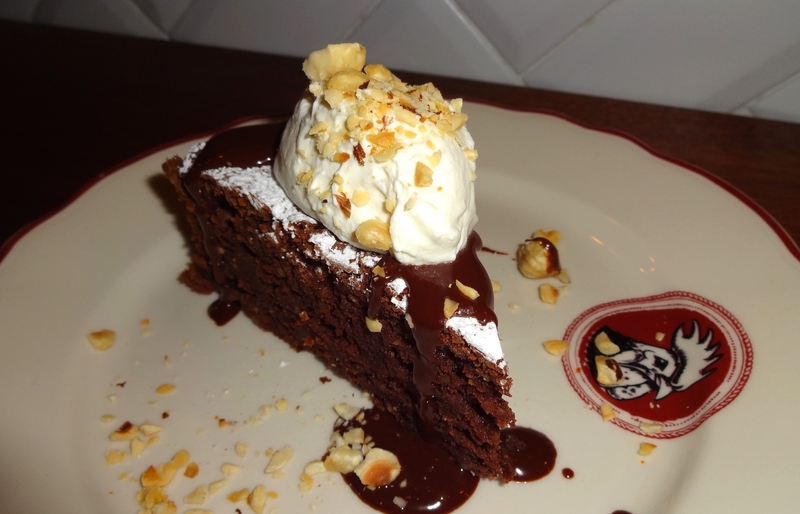 Chocolate and Hazelnut Cake with Mascarpone (6/10). The chocolate and hazelnut cake was average. Nothing special. Some of the well known specialties at Cockscomb are the bacon chop and the pig’s head. I really wanted to like every dish at Cockscomb but half of their dishes fell short. I think the main issue at Cockscomb is that they accept too many customers in the restaurant at a time and the kitchen isn’t able to keep up with orders leading to under seasoned food and improper cooking techniques. If they accepted fewer customers, the cooks can truly focus on every dish to give it the necessary attention to ensure quality for every person’s dish. Perhaps Cockscomb had an off night so I would be willing to try it again because some of the dishes were truly delicious. Overall, I would rate Cockscomb at a 6.5-7/10.